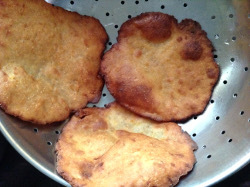 Bhopla gharge - Pumpkin sweet poori - pumpkin sweet fritters is very easy to make. 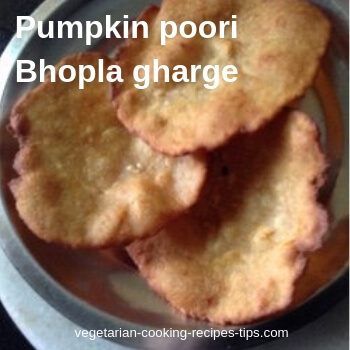 Bhopla gharge / Pumpkin fritters are served as breakfast, a side dish or as a snack. 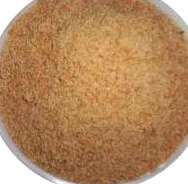 Usually red pumpkin is used for making gharge. You may use yellow / white pumpkin for this subji. All types of pumpkin taste good in this dish. 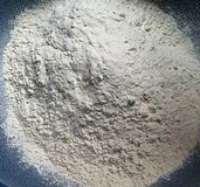 Wheat flour - about 1 1/2 cup, more or less as needed. Pumpkin / bhopla gives it's own flavor. These additional flavors, you may add if you wish. Add only one or a combination as you wish. I did not add any of these today. Cut pumpkin in large pieces and grate it. Grate jaggery or powder it. I powdered it. 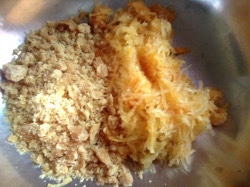 Add grated pumpkin and grated/powdered jaggery to a pan and heat it. 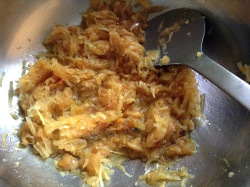 Mix pumpkin and jaggery well. 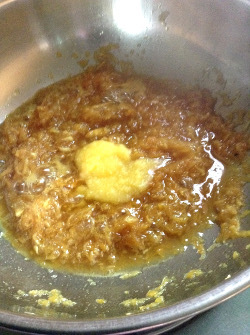 As you continue heating and mixing, jaggery will start to melt. Jaggery+pumpkin mixture will release some water. 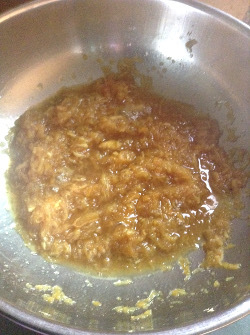 Continue cooking till all the jaggery is melted. Bhopla / pumpkin will be cooked by that time. When all the jaggery is melted, switch off the flame. Add a tablespoon of ghee to the pumpkin mixture. Ghee will melt because of the heat. Mix well and let cool completely. 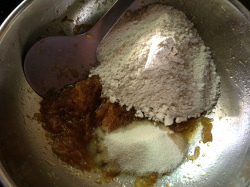 Add 1 cup wheat flour and rava/semolina to the pumpkin/ jaggery mixture. 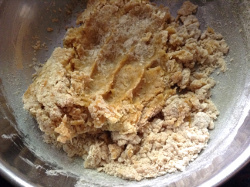 After adding 1 cup wheat flour and mixing, add more flour as needed to make a stiff dough. 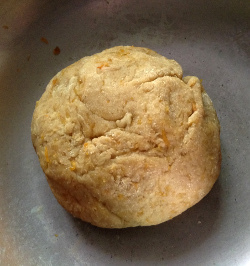 Form dough in to a ball. 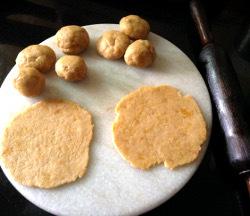 After keeping the dough for some time, make small balls as shown in the picture. Roll each ball into a small circle. Do not use any flour for rolling. If necessary, if the mixture is sticking to the board or rolling pin, use a drop of oil for rolling. Heat oil in your kadai/pan for frying ghagre. Fry one or two at a time. Do not add too many at a time. 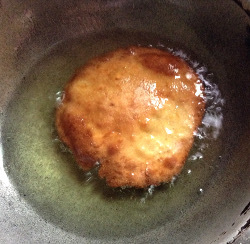 Take out gharge - pumpkin poori from oil when it is done and drain carefully. Put on a colander to cool. Store gharge in an airtight container. You may store at the room temperature. Gharge will keep good for about a week.